1. Put cleaned posole in a stock pot and cover with cold water by 3 inches. Cook the posole and simmer for 2 - 3 hours until the posole is soft and bursted. Add some water as needed. 2. Meanwhile, cook the pork with water, garlic powder, pepper corn and bay leaf until very tender about 2 hours. Keep removing "lye" while the meat is cooking. You can also use a crock pot or a pressure cooker. Discard the bay leaf and pepper corn and reserve the cooking water about 3 cups (skim fat out). 3. 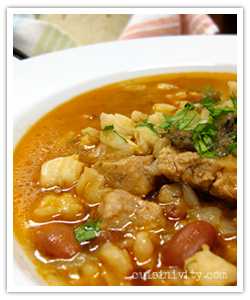 When the posole is done, drain and rinse with cold water. Set aside. 4. In a large pot, heat oil and sauté the onion and garlic until soft. Add chili powder, ground coriander and 1/4 cup for the cilantro and sauté for another minute. Add the Posole and mix well. Add chicken stock and reserved cooking water from the pork. Simmer for 30 min. 5. Add salt, pork, green chile and pinto beans and continue simmering for 30 min. Adjust with salt and pepper if you wish.